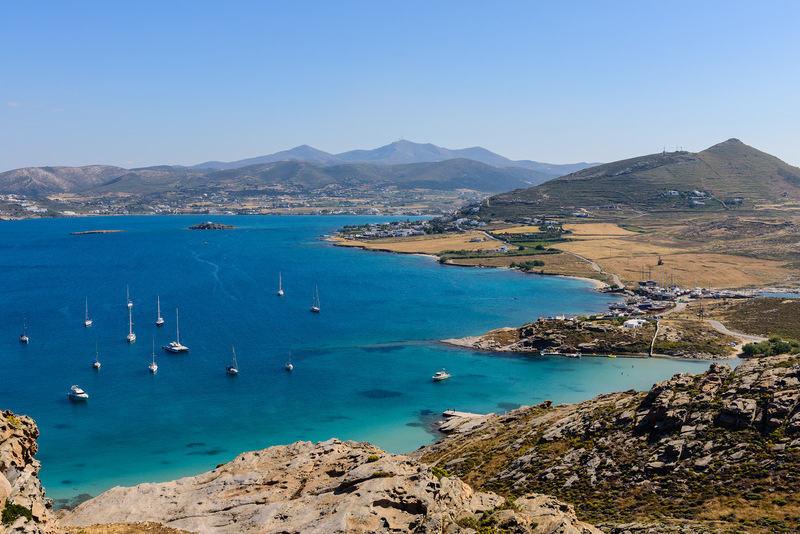 Separated from Naxos by an 8km-wide channel, Paros, close to the center of the roughly circular grouping of islands known as the Cyclades, has mostly served as a place ferries stop at on their way to somewhere else. 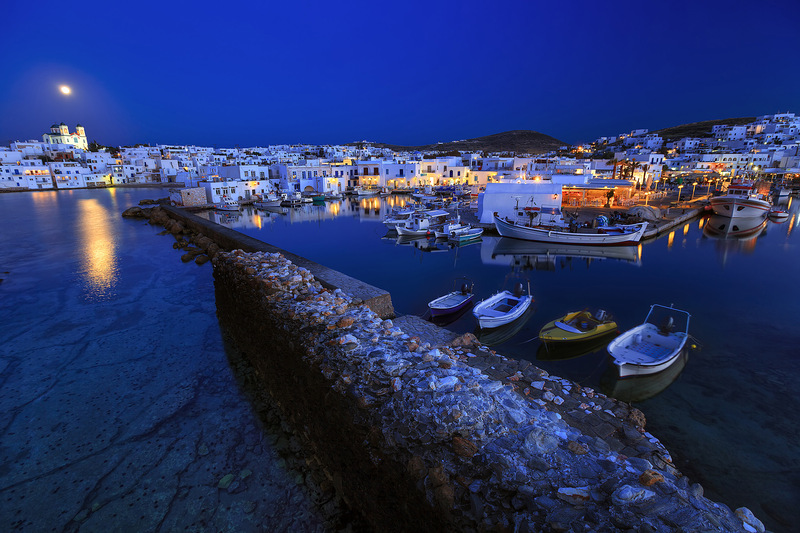 For example, Paros is the first stop on the Paros-Naxos-Santorini route, and all most people see of Paros is the port during the brief layover before shoving off for one of the other islands. But that's changing. 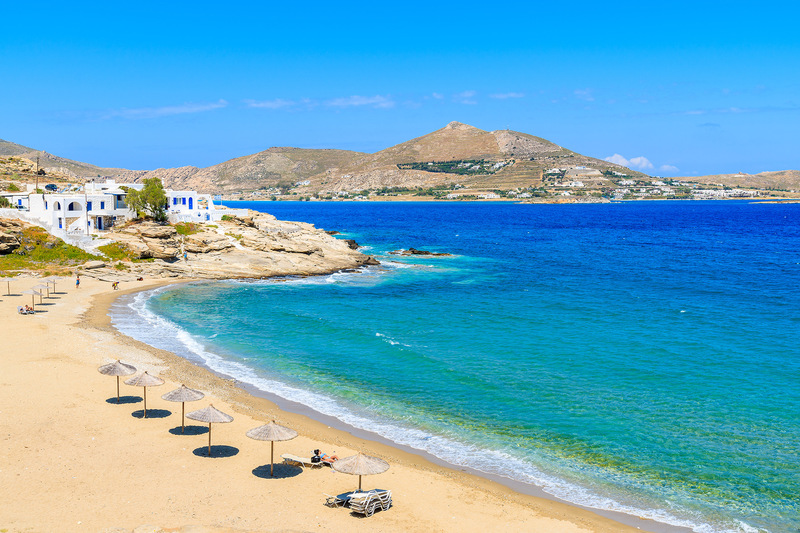 Young European partygoers who have been priced out of the fun on Mykonos, about 30km to the north, have been discovering the charms and the economic benefits of a holiday on Paros, which is just as beautiful, and cheaper than, Mykonos. In tourism, a "tell" for the attractiveness of any destination is, how many locals frequent it? By that measure, Paros is a great destination, because Greeks from Athens and elsewhere seem to love it. Paros was best known in antiquity for its marble. Parian marble is an exceptionally fine-grained, flawless stone with properties that admit light, giving it a semi-transparent luster. It was a very popular material for sculpture and public buildings during the Classical and Hellenistic eras. It was used in the Nike of Samothrace (the Winged Victory), the roof of the Parthenon, the statue of Hermes at Olympia, the Temple of Apollo on nearby Delos, and the Venus de Milo. People have been living on Paros since 3200 BC, excavations on the just-offshore islet of Saliagos tell us. A mythological Cretan king, Alkaios, grandson of Crete's king Minos, is said to have built, in antiquity, a city where Parikia, also called Paros Town, is. Paros's location had a strategic element, being about equidistant from Crete, Asia Minor, and mainland Greece, as well as being a large island with fertile soil. After a period of rule by the Ionians, followed by the Arcadians of the Peloponnese, Athens planted a colony of Ionians at Paros sometime before 500 BC. The island had by then become prosperous, planting a colony at the island of Thasos, in the north Aegean. Thasos had abundant timber, and mineral deposits. It had also built several temples, such as one dedicated to Athena, and another to the god of healing, Asklepios. The island's prosperity continued with the Athens-led Ionians in charge. Then Athens got a nasty surprise when Paros sided with the Persians during their first invasion of Greece in 490 BC. Their allegiance to Persia may have (and probably was) simply self-defensive in nature, but they paid for their decision when Athens sent an invasion force of their own to Paros as payback after repelling the Persians at Marathon. The siege failed, however. Later on, the Romans came, followed by the Byzantines, the Greek-speaking eastern Mediterranean successor state to Rome. After Constantinople, the Byzantine capital, fell temporarily to the Catholics of the 4th Crusade in 1204, Paros, along with a number of other Aegean islands, passed into the hands of the Venetians, until the Ottoman Turks came in 1537. After the Greeks gained independence following their war with Turkey which lasted from 1821-1829, Paros was united with the newly formed Greek state and found herself under the rule of fellow Greeks for the first time in nearly 600 years. Let's start with Parikia, or Paros Town (pop. 3,000), the island's main port of call and largest village. 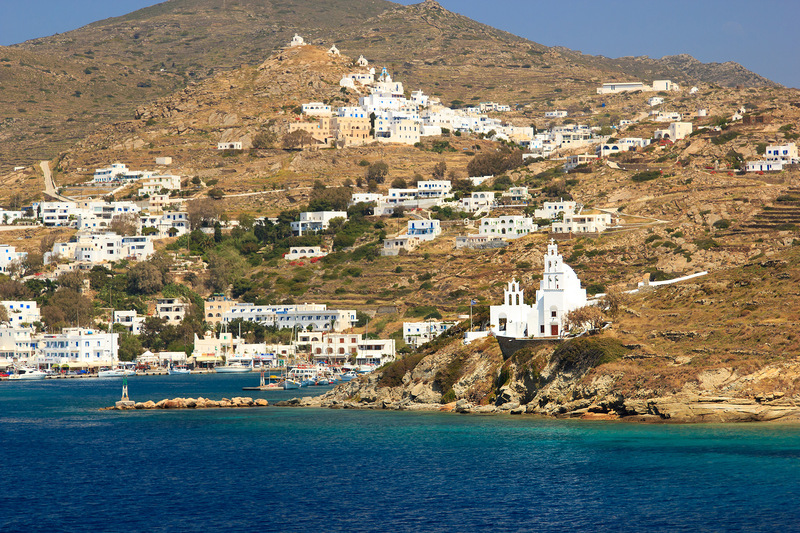 It's often all many people see of Paros, since they're on their way to somewhere else. But that's been changing recently, particularly among those young European partygoers mentioned in the introduction who have found in Paros a cheap alternative to Mykonos. One couldn't do much better in visiting Paros for the first time than to use Parikia as their base. Paros is shaped a little like a flattened American football angled on its T and ready for Naxos, its neighbor just to the east, to give it a good kick. 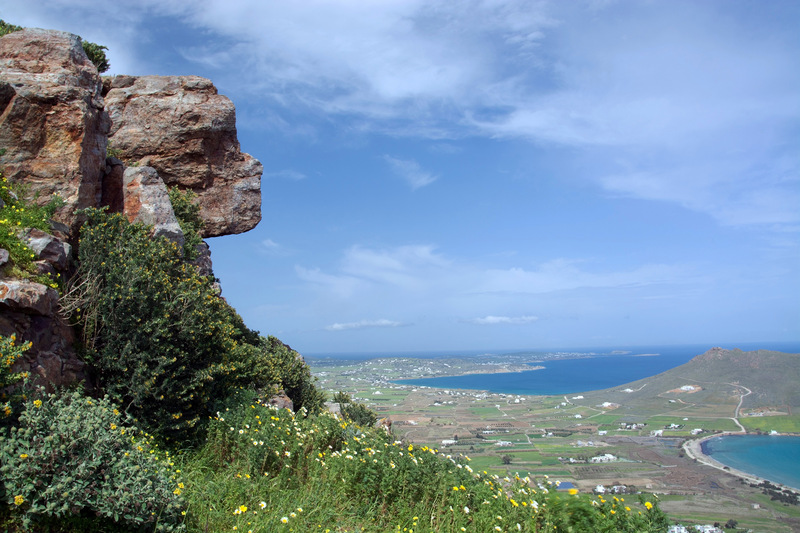 Parikia is centrally located on the island's west coast, making access to anywhere else on the Paros that much easier. The town's focal point is the whitewashed cylinder of the windmill near the port, where crowds getting off the boats mingle with Parians shilling for rooms to rent on the island. It's also an all-around convenient meeting place, and at any given time you can see at least some people standing around or sitting on the low, whitewashed circular wall surrounding the mill waiting for their pre-arranged rendezvous with friends. Parikia's central square is just behind the port. It's a broad, stone-paved expanse bordered by cafes and restaurants, and it's full of people in the evenings during the summer, taking strolls, catching the cooling sea breeze, relaxing with a coffee or a meal, or playing. Leading off the square is a warren of narrow streets, most of which are pedestrian because they're so narrow. Parikia's houses tend to be the low, cube-shaped buildings with rooftop terraces, whitewashed with blue doors and window casements, and arched passageways one often finds in the Cyclades. Trumpet vines, bougainvillea, and wisteria add splashes of color to the blue and white motif. Water Fountains, surrounded by ornate marble engravings, which were donated by the Manto Mavrogenous family, can be found here and there on the main streets of the village. About 300m south and west of the port, in the middle of a large park, is the church and monastery of Panagia Ekatonpiliani (Our Lady of the Hundred Gates), one of the oldest Christian complexes not only in the Mediterranean, but in the world. The story is that Constantine the Great (272-337 AD), founder of the Byzantine empire and the first Christian emperor of Rome, built the monastery to please his mother, who is revered by both Orthodox and Catholic churches as a saint and had a great influence on her son's spiritual life. The Paros Ancient Cemetery with graves dating from the 8th to the 3rd centuries BC located behind the picturesque marina, which is just to the west of the port. It's the most significant ancient cemetery in the Cyclades. The largest group of burials here took place from 650-600 BC. There is a 3m-high mass grave with a marker, likely the final resting place of soldiers killed in some long ago battle. The cemetery's excavations began in1983, and it looks as if its grounds extended westward all the way to the Panagia Ekatonpiliani church and monastery. Other ruins and older buildings in Parikia include the Asclepieion (4th cent. BC), just south of the village. It was both a temple and healing center. The Delion is the town's ancient acropolis, a hilltop on the village's north side that has the remains of temples to Apollo (9th-5th centuries BC) and to Artemis, just to the east of the temple to Apollo. The Delion is so-named because from its heights the ancients could see the sacred isle of Delos, 30km due north, and still visible today. There are also the remains of a13th century Venetian castle in the oldest section of Parikia. If you rent a motorbike you can take a quick trip to the mountainside behind Parikia to the monastery of St. Anagiri, which gives you a wonderfully panoramic view of Parikia, its bay, and much of the surrounding area. Parikia also has a nice archeological museum right by the marina, displaying artifacts from around Paros and next door Antiparos, date as far back as the Neolithic era (around 3,000 BC), on up to the early Byzantine era, and featuring statuary from the Cycladic, Pre-Classical, Classical and Hellenistic periods, figurines, mosaics, pottery and sarcophagi. Parikia is a quiet place, and at night it has a laid-back, pleasantly relaxed feel to it. In other words, there's not a lot of partying going on here. If partying is your thing, you'll want to head up the road to the northeast about 10km to Naousa. Naousa (pop. 2,800) is on the southern edge of a wide bay stretching east and west with a complex shoreline of little coves and smaller bays. It is one of the prettiest villages in the Cyclades, with narrow, pedestrianised streets of wide, grey paving stones traditionally whitewashed along their joints, making them look curiously like the hide of a grey giraffe, a narrow, cement-paved watercourse running through the town to the sea, with little cement slab bridges and a larger stone structure which reminds you a little of Venice's Bridge of Sighs where the watercourse widens considerably near the sea, colorful hanging vines and flowers, and a beautiful little marina and seaside promenade bordered by places to eat and drink. In the evening young people from all over the island descend upon Naousa to take advantage of the lively club and party culture, while tourists and locals catch the breeze along the seaside while venders hawk knick-knacks, touristy trinkets, sponges, candy and other items of interests from gaily lit portable stands. Kolymbithres (Swimming Holes), 10km west of Naousa, at the west end of the Naousa Bay is the best-known beach on Paros. It features beautifully clear water, many sandy and rocky coves, interesting rock formations that have been sculpted by wind, rain and sea over the millennia, and some beach bars, taverns, and places where you can rent sun beds and umbrellas. Piperi is the local beach for Naousa. This small, sandy cove has some rock formations as well, and a nice view of Naousa Bay. It's close enough to the village to walk to. Some other beached of note on Paros include Golden Beach, on the island's southeast coast, which has 700 meters of beautifully soft sand. Golden Beach does have winds- so much, in fact that the Professional Windsurfing World Cup is held here each August. Places to stay on Golden Beach are plentiful. Pounda is just north of Golden beach and 9km southeast of Parikia. It's a party beach, with its share of beach bars and night life, in addition to water sports. Most sun bed rental includes the proviso that you buy a drink from the club owning the sun bed. Santa Maria is a network of several small beaches 15km northeast of Parikia, on the northeast coast of Paros. These beaches offer just about every amenity you'd want, including camping, hotels, a water sports centers, a diving club and windsurfing rental and lessons. Paraporos ("Next to Paros") is just a kilometer down the road to the southwest from Parikia, and is popular with the locals, especially younger people. It has its fair share of tavernas and beach bars. The beach itself is long, with nice white sand and clear waters. Above and behind Kolymbithres Beach near Naousa is an ancient Mycenaean acropolis known as Koukounaries, dating from the 13th century, BC. There's not a whole lot to see there, but the view of the surrounding area is quite nice. Artifacts from this site are on display at the Parikia Archeological Museum. The ancient marble quarry at Marathi can be found on the road running south of Parikia to the inland mountain village of Lefkes. Marble is still being mined from this vast, kilometer-long excavation in the mountainside. Just southwest of the quarry is the Katafigio Agries Zois of Agioi Pantes-Stroumpoula, a wild animal refuge park inside of which hunting is prohibited. About 6km southwest of Parikia is the Butterfly Valley at Psychopaiana, a rare, well-watered place with plenty of vegetation providing a habitat for thousands of butterflies. In addition to the dozens of beautiful domed churches, small and large, dotting the island, here are a number of interesting old monasteries on Paros. The island had 35 monasteries at one time, and now there are just a hand full which are active. We've already mentioned the most prominent, the Monastery of Panagia Ekatontapiliani, in Parikia. There is also the monastery of Logovarda, 6km from Parikia. Dating from 1638, it's the largest monastery on Paros, and features an extensive old library full of rare manuscripts, in addition to a book-making workshop. The Isous ton Dason (Jesus of the Woods) nunnery, 6km southwest of Parikia, and close to Butterfly Valley, affords a splendid view of neighboring island Antiparos to the west.It has a church dedicated to the patron of Paros, Agios Arsenios, a saint who lived during the 1800's. The saint's remains are housed in the church. The grounds were the estate of the wealthy local Mavrogenous family, which donated everything to the church in 1973. Other monasteries include that of St. George, and St. Anthony. The biggest and most beautiful church on Paros is the church of Agia Triada (Holy Trinity), in the mountain village of Lefkes in the approximate center of the island. It is constructed of beautiful Parian marble, which is quarried nearby.